The simulator: antiwindup.exe . The simulator runs immediately after the download by clicking Open in the download window. Alternatively, you can first save a copy of the exe-file on any directory (folder) on your PC and then run the exe-file, which starts the simulator. The simulated system is a temperature PID control system for a tank with continuous inflow and outflow. The inflow temperature Tin is a disturbance to the control system. If Tin becomes low, the heating element reaches its saturation limit. The user can choose to activate or deactivate the anti windup in the PID controller, but in most commercial controllers some anti windup function is activated. Here is an instructional video where the present simulator is used as an example: Anti windup in a PI(D) controller. 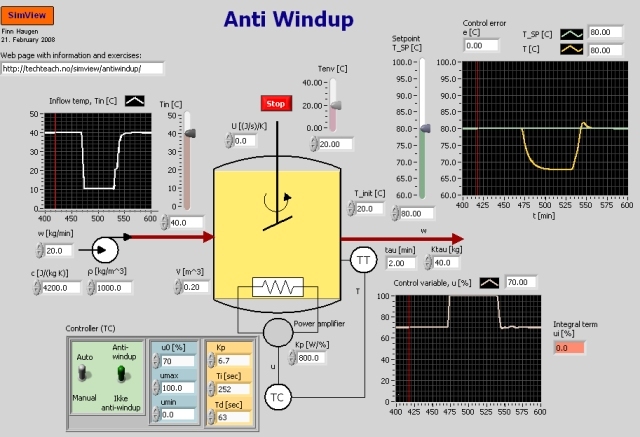 The aim is to observe the importance of having anti windup in the PID controller when a large disturbance drives the control variable into saturation. All practical PI(D) controllers must have anti windup, so this is standard in commercial controllers. If you are to implement a PI(D) controller yourself, it should definitely have anti windup. Reasonable PID parameter settings are shown on the front panel of the simulator (i.e. Kp=6.7, Ti=252s, Td=63s). The temperature setpoint can be set to 80 degrees C.
Control without anti windup: Deactivate the anti windup action. Set Tin = 40 degrees C, and let the control system settle to a steady state. Then reduce Tin to 10 degrees C and keep Tin at this value for about 100min. Does the control variable go into saturation? Then increase Tin back to 40 degrees. How long does it take until the temperature T converges to the setpoint with zero control error after Tin was increased from 10 to 40 degrees? To which value is the I-term (ui) integrated? Control with anti windup: Activate the anti windup, and adjust Tin as in Task 1. How long does it take before the temperature T converges to the setpoint with zero control error after Tin was increased from 10 to 40 degrees? To which value is the I-term (ui) integrated? Is anti windup of any importance? Updated 15 April 2017. Developed by Finn Haugen. E-mail: finn@techteach.no.